Mom and dad are the two most special people in your life. You can express your love and respect to them in a playful way by gifting them with an ideal gift, during special days in life like their birthday, anniversary, Mother’s Day, Father’s Day, Christmas or any other day. 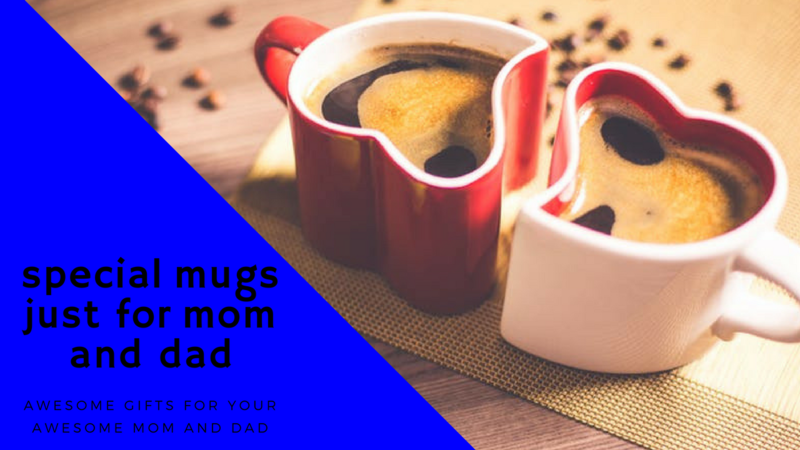 When you want to surprise them with a gift that they would appreciate and they will be able to use daily, you can opt for coffee mugs for mom and dad. According to our research on the largest online markets these are most times given and the best rated mom and dad matching mugs. This will be an ideal gift if you want to tell your parents how great they are for you. This coffee mug is made using high-quality ceramic and each mug is 4 inches tall, which allows space to hold 15 ounces of liquid. The ideal size and easy grip handle makes it convenient for aged person as well as young people to enjoy their daily coffee. It is easy to wash these mugs as they are dishwasher safe. As these mugs are microwave safe, you can use them to prepare or heat coffee directly in a microwave. If you are a parent, you can get it for yourself or you can gift them to your parents. You can get the product gift wrapped if you are going to gift the item. The inscriptions “world’s greatest mom and worlds greatest dad” are written with style and can convey your love for your parents in a pleasant way. 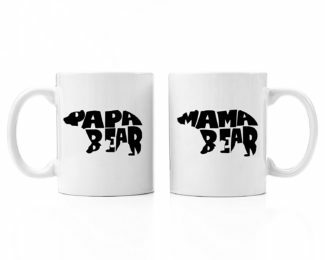 The Mama Bear & Papa Bear Coffee Mug Gift Set is the perfect gift for coffee enthusiasts. This gift can show what a wonderful and thoughtful kid you are and how you care for your parents. The shape of bear prints on both sides of the in an attractive style which is easy to read. The Mama Bear & Papa Bear represents the wonderful couples that your parents are. Each of these mugs can hold 12 Oz or 340ml of liquid. This is a ceramic coffee mug which can hold hot and cold liquids and comes with a sturdy base. The print on the mug is long lasting and the mugs are microwave and dishwasher safe. This will be a fun gift for your parents or anyone whom you consider as your mom and dad. This will be a great gift for any occasion. 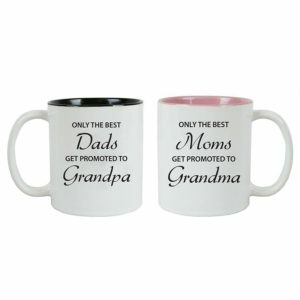 These mugs have the most impressive definition of mom and dad written on them. These mugs are ideal for drinking coffee, tea, hot chocolate etc. This ceramic mug has a white body and black handles. These are tall mugs with 6 inch diameter and 4.5 inches in height, which can hold approximately 20 ounces of liquid. This drinkware can be also used as a decorative item in your home or office or as pencil stand. Hand washing the mug will help the print to last for many years. These mugs are lead-free and are microwave safe and hence you can easily use the same mug for reheating the coffee. This versatile mug can be used as candy stash or as décor item and offers different functionality. This gift will be definitely adored by the recipients and other family members. You can get these Coffee mugs for mom and dad shipped to the address of your choice. You can honor your parents with this special coffee/ tea mug in a sentimental way. 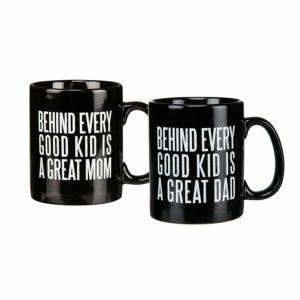 The message on the cup reading “Behind every good kid is a great mom” and “Behind every good kid is a great dad” is the best way to express your gratitude and love to your parents. These black ceramic mugs have bold, white text written in uppercase. The wide handle of the mug is designed perfectly to hold the cup in a comfortable way. Quality ceramic, the sentimental message and the perfect finish of this product makes it an ideal gift material for any parent figure. This mug measures 3.25”x3. 88” and can hold 11 Oz of coffee or tea. You can get free shipping of this item to any address preferred by you. You can insist for gift wrap if you want to send this item as a gift to your mom and dad. This will be the ideal gift for your parents who are going to be grandparents or have become the first time grandparents. This 100 percent ceramic mug has a white exterior and black interior for grandpa cup and pink interior of grandma cup. This mug can hold 11 Oz of hot or cold liquids. The C-shaped handle offers easy carrying of the mug while drinking coffee or tea. You can clean them easily by putting them in a dishwasher. They are also microwave-safe and hence convenient to use for reheating purpose. The message on the mug “Only the best dads/moms get promoted to grandparents” is the highlight of this gift. Any person receiving this gift will love this gift for the inscription on it. You can enjoy free shipping of the item to your doorstep. You will find this item an amazing gift for anyone expecting a grandchild, whether it is your friend, colleague, or teacher, etc. 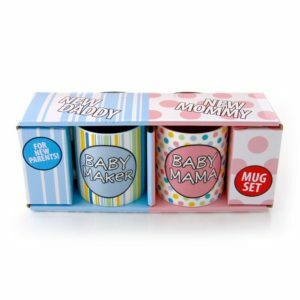 This product comes with perfect gift packing for any couple who are going to be new parents. This will be a unique gift you can give to a new mom and dad. The quality ceramic and high fired creation makes this stoneware mugs very durable. The design is created by the famous designer Lorrie Veasey and the attractive, fun and funky design can impress any recipient of the gift. This mug is dishwasher safe making it easy to clean and maintain. It is also microwave safe and hence highly functional. This gift is available in a gift box and there is no need for you to look for a gift wrap if you want to gift them. However, you can insist for gift wrapping if you want to make them appear unique for gifting purpose. This colorful and feels good gift-wrap is available for free shipping from many leading online stores. You will be able to find different options for coffee mugs for mom and dad when you search the product list of online shopping companies. You can do good research to find out finest quality product at the most affordable rates to gift your loved ones. You can find the coffee mugs with the required messages and designs according to your preference. You can also get the item gift wrapped if you want to present it on special occasions to your parents.